Schematic illustrating A)infiltration trench, B) underground infiltration, C) infiltration basin, and D) dry well. Stormwater infiltration practices capture and temporarily store stormwater before allowing it to infiltrate into the soil. Infiltration practices are applicable to sites with naturally permeable soils and a suitable distance to the seasonally high groundwater table, bedrock or other impermeable layer. They may be used in residential and other urban settings where elevated runoff volumes, pollutant loads, and runoff temperatures are a concern. Stormwater runoff having high pollutant loads should receive a significant amount of pretreatment to protect the groundwater quality, particularly if soil infiltration rates are high (e.g. HSG A soils). Runoff from potential stormwater hotsposts (PSH) should not be introduced to infiltration areas. Infiltration should be avoided in areas with contaminated soils or groundwater. Design variants discussed on this page include the infiltration basin, the infiltration trench, the dry well and the underground infiltration system. To see overviews for other infiltration practices, see the following sections. For discussions of how these practices differ or are similar to other infiltration practices, see Bioretention terminology and BMPs for stormwater infiltration. One of the goals of this Manual is to facilitate understanding of and compliance with the General Stormwater Permit for Construction Activity (MN R100001), commonly called the Construction General Permit (CGP), which includes design and performance standards for permanent stormwater management systems. These standards must be applied in all projects in which at least 1 acre of new impervious area is being created, and the permit stipulates certain standards for various categories of stormwater management practices. For regulatory purposes, infiltration practices fall under Section 16 (Infiltration systems) in the permit. If used in combination with other practices, credit for combined stormwater treatment can be given. Due to the statewide prevalence of the MPCA permit, design guidance in this section is presented with the assumption that the permit does apply. Also, although it is expected that in many cases infiltration will be used in combination with other practices, standards are described for the case in which it is a stand alone practice. The following terms are thus used in the text to distinguish various levels of stormwater pond design guidance. REQUIRED: Indicates design standards stipulated by the MPCA Permit (or other consistently applicable regulations). HIGHLY RECOMMENDED: Indicates design guidance that is extremely beneficial or necessary for proper functioning of the infiltration practice, but is not specifically required by the MPCA permit. RECOMMENDED: Indicates design guidance that is helpful for infiltration performance but not critical to the design. Of course, there are situations, particularly retrofit projects, in which an infiltration facility is constructed without being subject to the conditions of the MPCA permit. While compliance with the permit is not required in these cases, the standards it establishes can provide valuable design guidance to the user. It is also important to note that additional and potentially more stringent design requirements may apply for a particular infiltration facility, depending on where it is situated both jurisdictionally and within the surrounding landscape. Information: There is some concern that underground infiltration systems and dry wells meet the U.S. Environmental Protection Agency (EPA) definition of a Class V injection well. Class V injection wells are defined as any bored, drilled, or driven shaft, or dug hole that is deeper than its widest surface dimension, or an improved sinkhole, or a subsurface fluid distribution system (from U.S. Environmental Protection Agency, June 2003). Please consult EPA with questions on the applicability of Class V injection well rules. Infiltration trench: The narrow and versatile shape of infiltration trenches makes them well suited for retrofit projects. For example, infiltration trenches can be situated along the margin or perimeter of a developed site or roadway in many cases. They are particularly desirable as retrofit practices in watersheds or catchments that are targeting volume reduction practices to help minimize channel erosion. Dry well: Similar to infiltration trenches, the narrow and versatile shape of dry wells makes them well suited for most retrofit projects. However, dry wells are not well suited as retrofits for highway/road applications because of their small size and accessibility concerns. Underground infiltration systems: In settings where underground infiltration systems can be easily accessed for maintenance, they are ideal for retrofit situations. Another potential concern is fitting these systems, which can require significant space, into land uses where underground utilities are encountered. 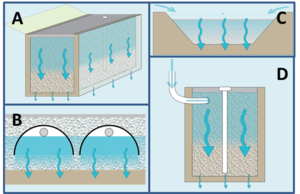 Infiltration basins: If adequate space exists, infiltration basins are suitable for retrofit applications. However, space considerations often limit their use in ultra-urban and highway/road settings. Warning: Use of infiltration practices is PROHIBITED in the CGP for treatment of runoff from industrial areas with exposed significant materials or from vehicle fueling and maintenance areas. Generally, infiltration should not be used to treat runoff from manufacturing or industrial sites or other areas with high pollutant concentrations unless correspondingly high levels of pretreatment are provided. The BMP design restrictions for special watersheds table below provides guidance regarding the use of infiltration practices in areas upstream of special receiving waters. This table is an abbreviated version of a larger table in which other BMP groups are similarly evaluated. The corresponding information about other BMPs is presented in the respective sections of this Manual. Infiltration practices should remain effective water quality improvement systems for many years, even during winter conditions, if designed and constructed properly and it has been shown that hydraulic efficiency and infiltration rates can remain at levels used for design sizing. However, in cold climates, some special considerations are HIGHLY RECOMMENDED for surface systems to ensure sustained functionality and limit the damage freezing temperatures and snow and ice removal may cause. One concern with infiltration in cold weather is the ice that forms both over the top of the practice and within the soil structure, which can completely stop infiltration. To limit the effect of this problem, it is HIGHLY RECOMMENDED that the facility be actively inspected to ensure that it is properly drawing down before it freezes in the late fall. Adequate drawdown can be determined using one of the several field assessment techniques such as those recommended by the University of Minnesota Extension (see section on Assessment). If it is determined that stormwater runoff is not infiltrating prior to hard freeze, the BMP should be placed offline for correction in the spring. Even if the infiltration properties of an infiltration practice are marginal for snowmelt runoff during the period of deep frost in the winter, the storage available in the facility will provide water quality benefit if it is dry entering the melt season. Routing the first highly-soluble portions of snowmelt (first flush) to an infiltration facility provides the opportunity for soil treatment (such as filtration, adsorption, microbial activity) of these soluble pollutants. Again, however, flow originating in an industrial area, a high traffic area where large amounts of salt are added, or another PSH should be diverted away from infiltration systems if pretreatment features have not been properly designed to handle such an increase in loading. Proprietary, sub-grade infiltration systems provide an alternative to standard surface based systems. Essentially, these systems provide an insulated location for pre-treated snowmelt to be stored and slowly infiltrated, or simply filtered and drained away if groundwater sensitivity is an issue. The insulating value of these systems adds to their appeal as low land consumption alternatives to ponds and surface infiltration basins. For all BMPs it is HIGHLY RECOMMENDED that snow and ice removal plans including predetermined locations for stockpiling be determined prior to or during the design process. Infiltration features cannot be used for significant snow storage areas as debris build-up, plant damage, and lower infiltration rates are likely to occur. Some snow storage unavoidable when BMPs are adjacent to areas where snow removal is required but it is critical that the property owner and snow and ice removal contractor have identified other areas for large scale snow storage. Excessive deicing agents have the potential to create a hot spot in some locations that could lead to reduced infiltration rates or concentrations that exceed surface water or groundwater standards. Locations such as busy intersections on slopes, parking garage ramps or on walkways near the entrances of commercial buildings are likely to be heavily treated with deicing agents to avoid slip and falls or vehicle collisions. This should be taken into consideration when siting any infiltration BMP. For bioinfiltration features, dry swales with check dams, and tree trenches, special considerations regarding snow and ice storage and plant maintenance are required. Plant selection is critical to ensure that the damaging effects of snow and ice removal do not severely impact plantings or seedings. Even a small amount of snow storage can break and uproot plants requiring additional maintenance in the spring. Woody trees and shrubs should be selected that can tolerate some salt spray from plowing operations. The amount of stormwater volume infiltrated depends on the design variant selected. Smaller infiltration practices (e.g. infiltration trenches) should either be designed off-line using a flow diversion, or designed to safely pass large storm flows while still protecting the infiltration area. In limited cases (e.g. extremely permeable soils), these smaller infiltration practices can accommodate the channel protection volume, Vcp, in either an off- or on-line configuration. In general, supplemental stormwater practices will be necessary to satisfy channel and flood protection requirements when smaller infiltration practices are used. However, these practices can help reduce detention requirements for a site through volume reduction. Due to their size, the larger infiltration practices (e.g. infiltration basins and underground infiltration systems) have the potential to provide greater water quantity benefits. Surcharge storage above the practice bottom is available for detention. Outlet structures can be sized to partially or fully accommodate larger storm peak discharge control while allowing the volume below the outlet to infiltrate. Infiltration practices can remove a wide variety of stormwater pollutants through chemical and bacterial degradation, sorption, and filtering. Surface water load reductions are also realized by virtue of the reduction in runoff volume. There are few data available demonstrating the load reductions or outflow concentrations of larger-scale infiltration practices such as infiltration trenches. Similarly, few sampling programs collect infiltrating water that flows through an infiltration system. For properly designed, operated, and maintained infiltration systems, all water routed into them should be “removed” from stormwater flow, resulting in 100 percent efficiency relative to volume and pollutant reduction. For this reason, any infiltration BMP performance table should show all 100 percent entries for that portion of stormwater entering the infiltration system. This logic assumes that stormwater is the beneficiary of any infiltration system, but ignores the fact that pollution, if any remains after the internal workings of the infiltration BMP itself (see later discussion in this section), is being transferred into the shallow groundwater system. Good monitoring data on the groundwater impact of infiltrating stormwater are rare, but there are efforts underway today to document this, so future Manual revisions should be able to include some data updates. Properly designed infiltration systems discussed later in this section will accommodate a design volume based on the required water quality volume. Excess water must be by-passed and diverted to another BMP so that the design infiltration occurs within 48 hours if under state regulation, or generally within 72 hours under certain local and watershed regulations. In no case should the by-passed volume be included in the pollutant removal calculation. Data that are reported in performance literature for infiltration systems, unless reporting 100 percent effectiveness for surface water or documenting outflow water downward, are not accurately representing behavior, or are representing the excess flow (overflow) from a system. Design specifications in the following sections should prevent putting contaminated runoff and excess water beyond that which will infiltrate within the given time frame. Any runoff containing toxic material or excess volume that cannot infiltrate should be diverted away from the infiltration system and reported as inflow to another treatment device. The following general limitations should be recognized when considering installation of infiltration practices. Limited monitoring data are available and field longevity is not well documented. Failure can occur due to improper siting, design, construction and maintenance. There is a risk of groundwater contamination depending on subsurface conditions, land use and aquifer susceptibility. They are not ideal for stormwater runoff from land uses or activities with the potential for high sediment or pollutant loads. They are not recommended for areas with steep slopes. Please note that even though there are potential pollution and physical clogging problems with infiltration, it is one of the most important elements in the stormwater runoff treatment train. Fear of the limitations should not prevent well designed systems from being used. As noted in various sections, discussion of BMP selection, the benefits associated with infiltration BMPs should only be accrued based on the amount of water actually passing through the BMP. Excess runoff beyond that designed for the BMP should not be routed through the system because of the potential for hydraulic and particulate over-loading, both of which will adversely impact the life and operation of the BMP. For example, an infiltration device designed to treat the first 0.5 inch of runoff from a fully impervious surface will catch about 30 percent of the volume of runoff in the Twin Cities. This means that 70 percent of the runoff volume should be routed around the filtration system and will not be subject to the removals reflected in the above tables. Attributing removal to all runoff just because a BMP is in place in a drainage system is not a legitimate claim. Warning: It is REQUIRED that some form of pretreatment, such as a plunge pool, sump pit, filter strip, sedimentation basin, grass channel, or a combination of these practices be installed upstream of the infiltration practice. This page was last modified on 28 August 2018, at 11:52.